After pricking the seedling plug from the garden seedling tray, the next thing to do is repot it. 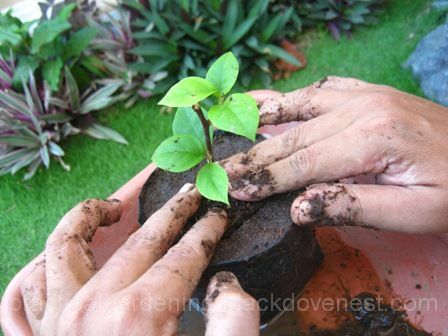 For most garden plants, repotting is fairly straightforward. 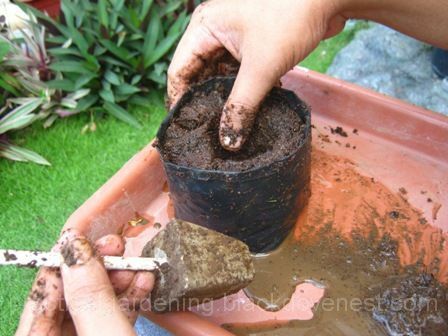 Take a stick or use a finger to create a hole on the ground or the pot's soil. Put the seedling's root ball in and backfill with garden soil. Some garden seedlings though have a more delicate root system where the roots break off easily if mishandled. Sometimes an unintentional sudden tap on the main stem may break young brittle roots. Such is the case for Bougainvillea seedlings grown from cuttings. 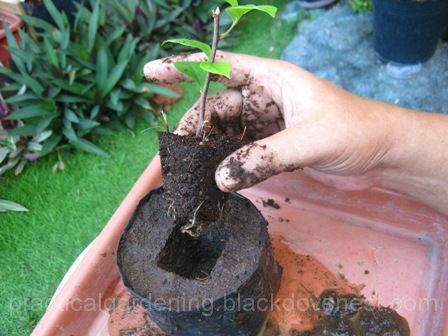 Bougainvillea cuttings root easily but the young roots are very tender. The roots of newly established seedlings from the cuttings cannot even hold the root ball. 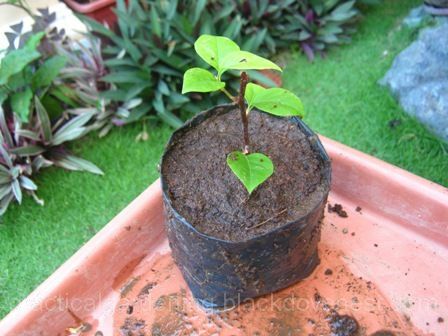 Holding the bougainvillea seedling by the stem may cause the entire root ball to fall off. When it does, it takes with it the root ball soil and all the seedling's roots. The gardener is left with a stick with leaves and no roots. A way to safely repot young seedling plugs with delicate roots is to use a dibber with a dibber head that matches the size and shape of the seedling plug's. It's actually easy to make a customized dibber for seedling plugs taken from a garden seedling tray. Shown above is a custom dibber. Mix potting soil and water in a small basin. The soil should be soaking wet and has the consistency of mud. 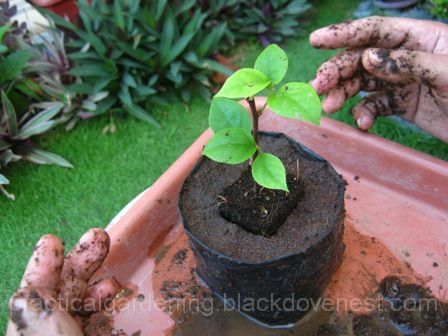 Scoop up the wet potting soil and fill up a seedling bag or any other container (like a garden pot). With your thumb, dig a pilot hole. The hole's diameter should be a slightly larger than the garden dibber's head and should be just as deep. Bury the garden dibber into the pilot hole that was just created. 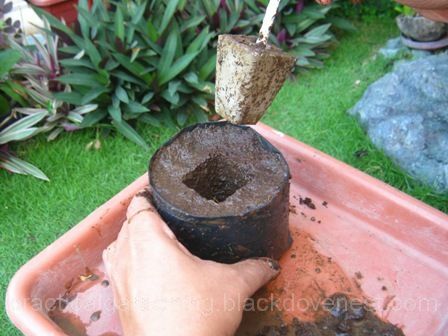 Ensure the top of the dibber's head is level with the potting soil's surface. 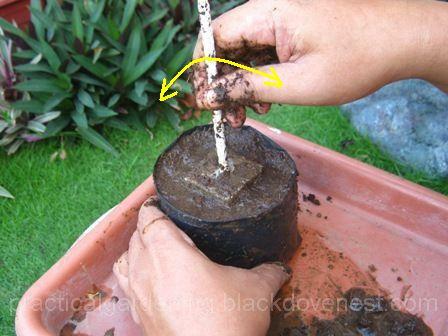 Note that the wetter the soil, the easier it is to insert the dibber head. Also, soil that has plenty of fibers (like coco coir) may resist the penetration of the dibber head. With the garden dibber head still buried in the soil, backfill wet soil into the seedling bag so there are no spaces around the hole. 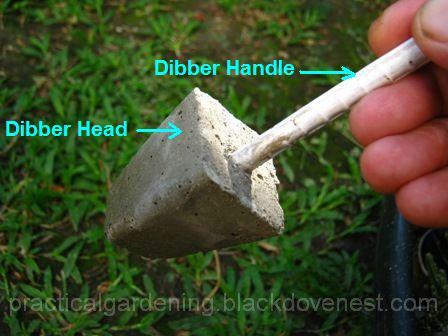 To remove the garden dibber, loosen the garden dibber head by rocking the dibber handle slightly as shown below. 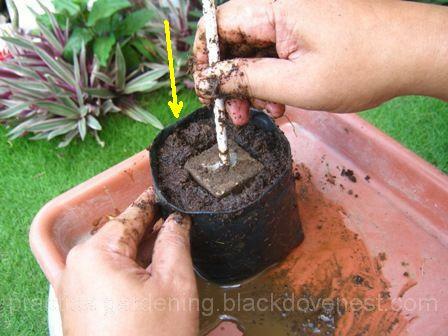 Slowly pull out the garden dibber from the potting soil as shown below. What's left in the soil is the impression of the garden dibber head. Optionally put in an inoculant or soil amendment inside the newly created hole. Warning, anything placed inside the hole will be in direct contact with the roots of the seedling plug. 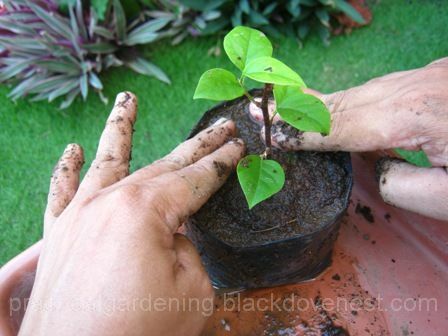 Carefully bring the seedling plug to the hole, taking care not to disturb the roots nor touch any of the seedling foliage. Slowly position the seedling's root ball inside the plug hole and then let it rest as shown below. 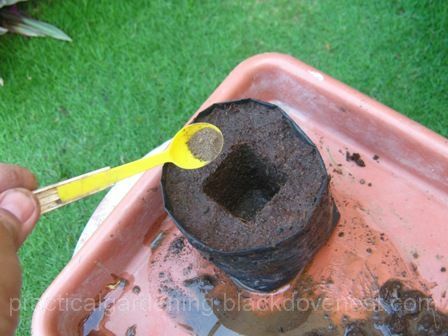 Gently tamp down the exposed part of the root ball into the plug hole so it slides down and becomes level with the potting soil's surface. Avoid hitting the seedling's stems in the process. Backfill a thin layer of wet soil and spread evenly on the surface. Tamp down on the backfill potting soil as shown below. Shown below is the newly repotted garden seedling plug.